The Most Noble Order of the Garter, its History, Ceremony, Coats of Arms and Crests. The Oldest and Highest British Order of Chivalry, founded in 1348 by Edward III. 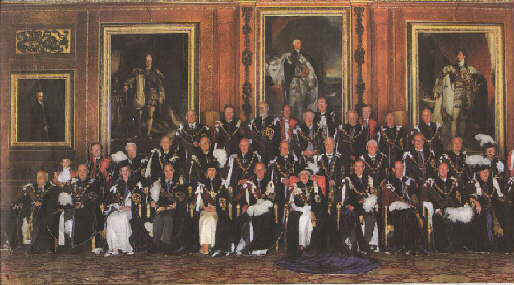 Order, His Royal Highness The Prince of Wales and 24 Knights Companions. The origin of the symbol of the Most Noble Order of the Garter, a blue 'garter' with the motto Honi Soit Qui Mal Y Pense will probably never be known for certain as the earliest records of the order were destroyed by fire, however the story goes that at a Ball possibly held at Calais, Joan Countess of Salisbury dropped her garter and King Edward seeing her embarrassment picked it up and bound it about his own leg saying in French, Evil, (or shamed) be he that that thinks evil of it' this is almost certainly a later fiction. This fable appears to have originated in France and was, perhaps, invented to try and bring discredit on the Order. There is a natural unwillingness to believe that the World's foremost Order of Chivalry had so frivolous a beginning. It is thought more likely that as the garter was a small strap used as a device to attach pieces of armour, it might have been thought appropriate to use the garter as a symbol of binding together in common brotherhood. 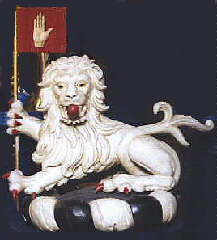 Whilst the motto probably refers to the leading political topic of the 1340's, Edward's claim to the throne of France. The patron saint of the Order of the Garter is St George and as he is the patron saint of soldiers and also of England, the spiritual home of the order has therefore always been St George's Chapel in Windsor Castle. The patron saint of the Order is St George who is the patron saint of soldiers and also of England; the spiritual home of the Order is St George's Chapel, Windsor. Every knight is required to display a banner of his arms in the Chapel, together with a helmet, crest, sword and an enamelled stallplate. These 'achievements' are taken down on the knight's death and the insignia are returned to the Sovereign. The stallplates remain as a memorial and these now form one of the finest collections of heraldry in the world. The holders of this Order as a Knights Companion, entitles the recipient the right to use the title 'Sir' before their Christian names as well as being entitled to add the letters 'K.G' ( Knight of the Garter ) or in the case of a Lady Companion 'L.G.' Lady of the Garter, after their surnames or title. set amongst diamonds in gold, encircled by the Garter in blue enamel. 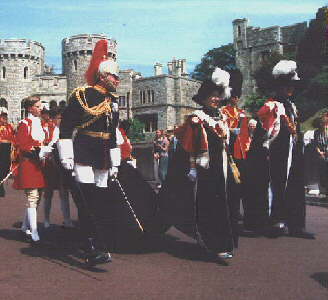 The procession of the Order of the Garter at Windsor Castle. 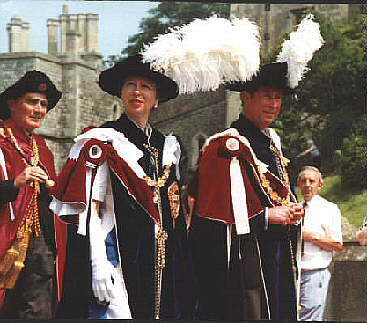 The Most Noble Order of the Garter is one of the oldest and most important of all such Orders throughout the world, with the concept of like minded brotherhood dedicated to service and chivalry, these core principals having survived intact and are as relevant today as at its conception over 650 years ago. With a thousand appointments of royalty, soldiers, statesmen, favourites, magnates, and a few traitors having been made since 1348. It was during the 11th and 12th centuries within the warrior-classes the idea of the medieval notion of chivalry and knighthood first developed. The Crusades in the Middle East had released these men from the previous constraints of feudalism. They could now express their new-found identity by the creation of religious and military orders of chivalry. The earliest orders of knighthood were amongst groups of like-minded men who being drawn from a particular social class were therefore bound together in a common purpose. Then all go in procession to the Chapel for service wearing the full robes of the Order, including black velvet hats with white plumes, and any new members are installed. On the day after, the mantle only is worn. The Garter itself is worn throughout. The Greater George must be worn on all official holidays, on Ascension Day, at the funeral of a member of the Order, and when a member of the Order is created a Peer. 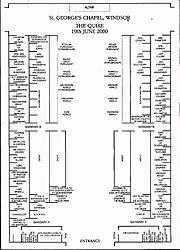 Although the original medieval membership of the order consisted of the British sovereign and the Prince Wales, each with 12 companions, as if at a tournament. Membership was expanded in the late 18th and early 19th centuries to include supernumeraries such as members of the royal family (known as "royal knights companions"), lineal descendants of George I and George II, and foreigners (known as "extra knights"). The British sovereign and Prince of Wales are always members of the order. Originally, existing knights elected new knights, but now appointment to the order is solely at the discretion of the British monarch. Women have been made ladies of the order, but they are not ranked among the 25 knights companions. 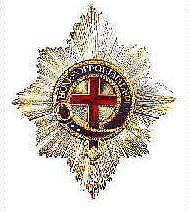 The foundation of the Order of the Garter by King Edward III in the early fourteenth century, brought together in close companionship the Sovereign and twenty-five of the most outstanding military leaders of the country at that time as a means of marking and securing alliances; it also established a new fellowship in religious worship ' to the honour of Almighty God, the glorious Virgin Saint Mary and Saint George the Martyr'. Since foreign monarchs have been appointed to the Order from the fifteen century, one of the earliest such appointments was the Duke of Urbino by Edward IV in 1474. 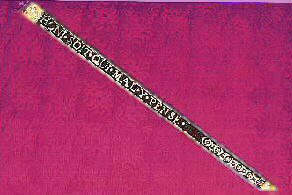 Such appointments were and are occasionally made to non-Christian rulers ( for example, the Shah of Persia in 1902 ), which prompted some debate over the possibility of removing Christian imagery ( the cross of St George ) from the Order when it is given to non-Christian recipients; in the end however the design remained unchanged. Prince Albert's Garter was made in 1840 and was worn by the Knights beneath the left knee and by the Ladies above the Elbow. The Garter’s motto 'Honi Soit Qui Mal Y Pense' is set in diamonds on dark-blue velvet, and the buckle is set with one small and seven large brilliants. It was thought that in 1344 King Edward III inspired by the legend of King Arthur and the Knights of the Round Table, made a spectacular demonstration of his interest in Arthurian legend during a massive joust at Windsor Castle. He also promised to renew King Arthur's fraternity of knights with all the paragons of knightly virtues with a complement of 300 men. Work also even began on a gigantic circular building two-hundred feet across within the upper ward of the castle to house this so-called Order of the Round Table. The renewal of war with France intervened with this project but in 1348 it was revived in a different guise. Originally it was intended that the Order of the Garter was to consist of twenty four knights, however during 1349/50 it consisted of himself as Sovereign together with twenty five Knights Companion, one of whom was the Prince of Wales, the black Prince. These 'founder knights' were military men, skilled in battle and tournaments, few of these knights were much over the age of 30 and four were under the age of 20. The other founder-knights had all served in the French campaigns of the time, including the battle of Crécy and three were foreigners who had previously sworn allegiance to the English king, making twenty six knights in all. it was intended by Edward III to be reserved as the highest reward for loyalty and for military merit. These Knights included some who owed allegiance to King Edward not as King of England, but as Lord of Gascony . These Companions were known as Stranger Knights a distinction from subjects of the English Crown. Such was the prestige of the Order that during the next hundred year’s foreign monarchs in the Order are admitted and known as 'Stranger Knights' and are in addition to the number allowed by statute. The Collar is of gold and weighs 30 troy ounces and consists of twenty six red enameled roses each interspersed with twenty six gold knots with a pendant representing St George and the Dragon. The roses and knots are placed alternately and joined to each other by gold links. The insignia of the Order has gradually developed over the centuries, starting with a garter and badge depicting St George and the Dragon. A collar was added in the sixteenth century with the star and broad ribbon being added in the seventeenth century. Although the collar could not be decorated with precious stones (the statutes forbid it), the other insignia could be decorated according to taste and affordability. As part of the original College of St George, Edward III established a community of twenty-six impoverished military veterans known as 'Poor Knights' who were required to pray daily for the Sovereign and the Knights of the Garter during life and also for their souls after death. 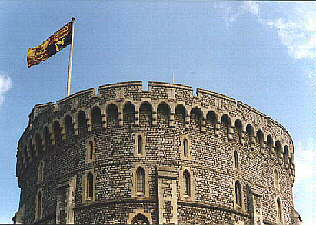 In return they received maintenance and lodgings in Windsor Castle. This number of twenty-six was reduced to thirteen by Elizabeth I at the request of her father Henry VIII. During the early years of the nineteenth century these Poor Knights who were all retired army officers, objected to being termed 'poor' and petitioned the Sovereign William IV to be allowed to wear the uniform of Unattached Officers a uniform and to change their name. 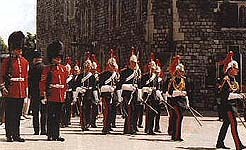 In 1834 the name was subsequently changed to Military Knights and the members no longer had to wear their red cloaks but instead were allowed to wear their new uniforms with its plumed and cocked hat which is still worn today. 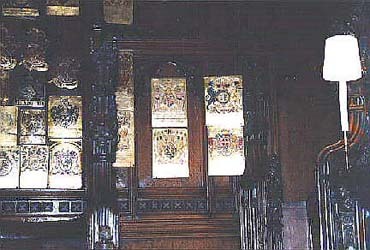 Each newly appointed Knight, or more recently Lady of the Order is assigned a stall in St George's Chapel Windsor from which their banner displaying their coat of arms is hung. 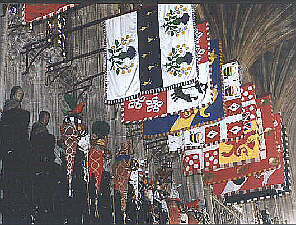 Beneath the banner is a Knights helm (helmet) on which is placed the carved and painted representation of the Knights Crown or Crest. 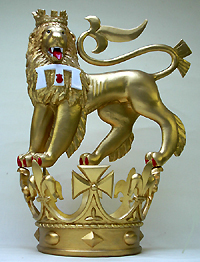 In the case of Stranger Knights who are Sovereign, Princes or Princesses, instead of a carved Crest their carved and gilded representation of the State Crown is placed upon the Knights helm. For Ladies Companion, who, as women by the rules of English Heraldry has no right to a Crest, a Coronet of rank, if they are a peeress, is placed upon the helm. Heraldry are often seen as an exciting picture language using stunning images, vibrant design and visual colour, incorporating a glorious mêlée of signs and symbols which are frequently chosen not only to reflect the life but also the career of the person concerned. Although Heraldry is viewed by many today as an ancient art form, its images are as strong today as they were in the Middle Ages. All over the world Heraldic Arts traditional striking designs of realistic and fanciful creatures are frequently borrowed and turned into successful corporate trademarks and modern logos. 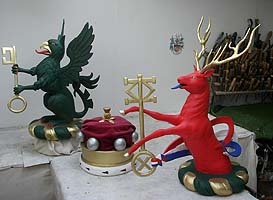 A small selection of the over eighty Crowns, Coronets and Crests that have been carved and painted by Ian G Brennan before they were placed in St George's Chapel Windsor and Henry VII Chapel in Westminster Abbey for the Knights of the Most Noble Order of the Garter and Most Honourable Order of the Bath. bottom row - Lord Beetham - Sir Frank Cooper - Sir Henry Leach - Knights of the Order of the Bath. 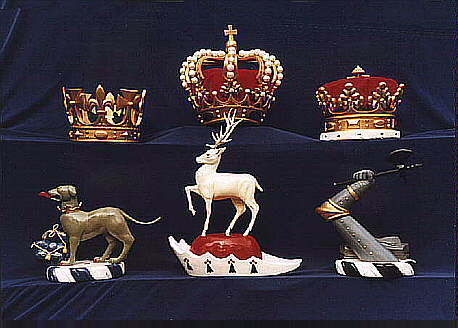 Crowns, Coronets and Crests for the Royal Knights, Extra Knights and Ladies, Knights and more recently, Lady Companions of the Most Noble Order of the Garter have been placed above the Knights stalls (seats) in St Georges Chapel in Windsor Castle for almost six Centuries. The latest Ladies and Knights of the Garter are officially announced on 23 April; St George's Day from Buckingham Palace. 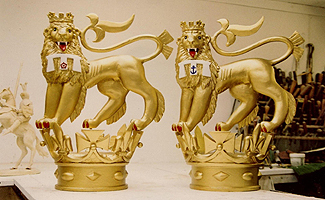 For over years all the carved, painted and gilded Crowns, Coronets and Crests for the Order of the Garter and Knights of the Bath have been produced by sculptor Ian G Brennan. 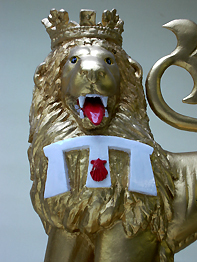 They are mostly carved from lime wood which Ian then paints and gilds and are between 12 - 28 inches high. The Knights Crests were originally worn on top of the Knights helm (helmet) during pageants and tournaments in the fourteenth century and used as a form of identification. Fighting at tournaments was also a good way of training for battle. Each Crest Ian produces which is placed upon a wreath he also carves from lime wood to represent a circle of two twisted ropes of silk, each of a different colour. The original purpose of the wreath was to disguise the join between the helm and the Crest. Up until the seventieth century all the wreaths in St George's Chapel were still made from actual twisted cloth, however since that time they have all been mostly carved from lime wood. 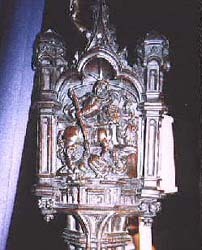 One of the carvings by Ian G Brennan commissioned to be placed in Westminster Abbey is of a Medieval Knight in full battle armour having scored a point whilst riding in tournament, depicted by the Knights broken lance. When a Knight was jousting he would try and score the best of three points from three lances to win the match. The Knights lances were tipped with Cornell's which blunts them so as to reduce the chance of serious injury to the opponent. One point is made by breaking the lance between the waist and neck of the opposing Knight. Two points we made by breaking the lance on the helm of the opponent, this was more difficult to do as the head sweeps back with the force of the blow which would often leave the lance unbroken. Three points would be made by breaking the lance and also bringing the rider to the ground. 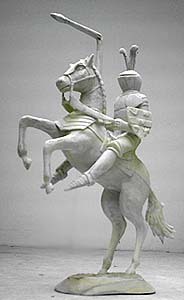 The victor on this occasion would also win the defeated knights horse. Only Knights of Noble birth over at least three generations would be allowed to ride at tournament. 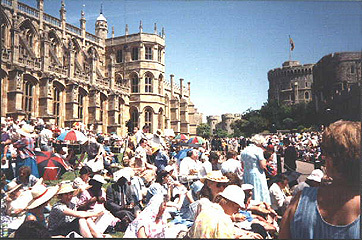 For almost two centuries each year, usually at St George's - tide in April the Sovereign and Knights of the Garter met at Windsor Castle for a Festival which lasted for three days. They gathered in Chapter, feasted in St George's Hall and occupied their stalls in St George's Chapel for Matins, the Eucharist, Evensong and Requiem for departed Knights. From 1674 onwards until 1805 services were held less frequently and during the remainder of the 19th century the life of the Order was restricted to Chapter meetings for investitures and elections normally held in London. In 1948 His late Majesty King George VI commanded the Knights of the Garter to once again assemble at Windsor Castle for a Chapter meeting, to Process through the Castle and to have a Service at St George's Chapel. Since that time a Garter Day of this type has been regularly held each June. The procession taken by the Garter Knights from the Upper ward to the Royal Chapel is a public witness to the long tradition of the Sovereign and the leaders of the nation giving their allegiance and thanksgiving to God for creating, renewing and sustaining the World. The number of Knights Companion remained at twenty six until the reign of George III when additional or Supernumerary appointments were made. Firstly from 1786 all the sons of the Sovereign were declared to be eligible to be appointed in addition to the twenty six (George had nine sons) from1805 the Prince of Wales upon his creation immediately become a member of the Order of the Garter. In 1813 all Stranger Knights were appointed as Supernumerary. From the Eighteenth century to 1946, appointments to the Order of the Garter were made on advice from the government. Today the Order has returned to its original function as a mark of royal favour; Knights of the Garter are chosen personally by the Sovereign to honour those who have held public office, who have served the Sovereign personally or who have contributed in a particular way to national life. Although for much of its history, the Garter was limited to the aristocracy, today the Garter knights are from a variety of backgrounds. Since the first Knight of the Garter Edward, Prince of Wales (the Black Prince) was installed by King Edward III in around 1348, there have been 1000 Knights of the Garter, Prince William of Walesbeing the 1000 knight who was installed into the Order by HM The Queen in 2008. most recent sovereign being HM King Harold V of Norway who was installed during the Queens Golden Jubilee in 2002 There have been many famous Knights of the Garter installed during the HM the Queen's present 50 year reign. Since 5th December 1953 the Queen who is the Thirtieth Sovereign has installed over eighty Knights into the Order which have included many of the most prominent figures in recent years from British public life, including former war time leader Sir Winston Spencer Churchill, as well as many foreign Royals. These also include other former British Prime Ministers, Major, Heath, Wilson and Callaghan who all became Knights of the Garter, Baroness Thatcher was installed as a Lady Companion and HRH the Prince of Wales and HRH Prince Philip are Royal Knights. Juan Carlos, King of Spain, Carl Gustaf, King of Sweden and more recently King Harald V of Norway became extra Knights Companions, as is His Imperial Majesty Emperor Akihito of Japan, who was made a Garter Knight in 1998. 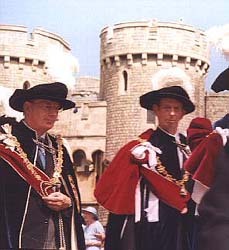 On the 18th of June 2001 the two Garter Knights installed by Her Majesty the Queen in St George's Chapel were Sir Anthony Acland, KG and Field Marshal Lord Inge, KG. On the 16th of June 2002 the only Knight to be installed during HM The Queens Golden Jubilee Year was HM King Harald V of Norway KG. As per tradition on the 23 April, St George's Day the latest Knights of the Garter were officially announced from Buckingham Palace. 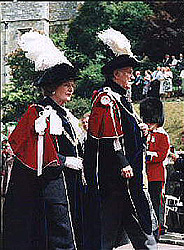 On the 16th of June 2003 in glorious sunshine the pomp and splendour of the Garter procession could once again be seen as the latest Lady Companion and Knights of the Garter, along with the other previously installed Knights and Lady Companions of the Garter began the procession at Castle Hill walking down from the State Apartments at Windsor Castle to the lower wards before entering St George's Chapel. These included the Queens first cousin, Her Royal Highness Princess Alexandra, The Hon. Lady Ogilvy, GCVO who was then installed in St George's Chapel as a Lady Companion of the Most Noble Order of the Garter. This high honour was a personal gift of the Queen in recognition of her charity work and seniority within the Royal Family. Princess Alexandra's appointment as a Member of the Royal Family, is in addition to the established number of 24 Companions. HRH The Duke of Edinburgh was created a Knight in 1947, HRH The Prince of Wales in 1958, HRH The Duke of Kent in 1985, HRH The Princess Royal in 1994, and more recently in 1997, HRH The Duke of Gloucester. 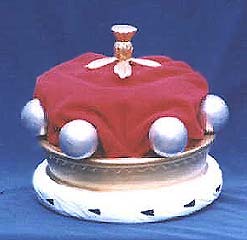 The appointment of Knights and Ladies of the Order of the Garter, Order of the Thistle, the Order of Merit and the Royal Victorian Order is in The Queen's Personal Gift and is made without Prime Ministerial advice. 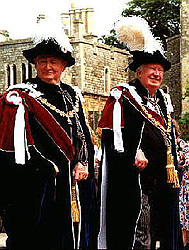 The three Knights of the Garter who were also installed in 2003 at Windsor Castle were The Duke of Westminster, OBE, TD, DL, The Right Honourable Lord Butler of Brockwell, GCB, CVO the former Cabinet Secretary and The Right Honourable Lord Morris of Aberavon, QC. 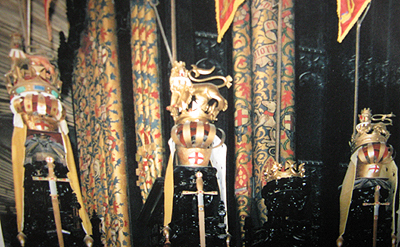 These three Crests and the Coronet for HRH Princess Alexandra were completed early in 2004 and placed in position above their stalls in St George's Chapel. In 2005 the Knights of the Garter appointed to this the most senior and oldest order chivalry was John Major who was the former Conservative Prime Minister and now becomes Sir John Major. KG, one of the 24 Knights. The Queen also appointed Lady Soames, the daughter of Sir Winston Churchill. Her appointment as a Lady of the Garter is the first non-royal, father daughter appointment in the orders 650-year history. Lord Bingham of Cornhill who was the former lord chief justice was the third of that years appointments. 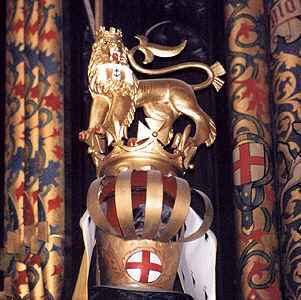 The Duke of York’s Crest placed in position in St George’s Chapel. 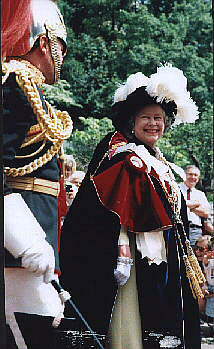 On 23 April in 2006, St George's day; The Duke of York and the Earl of Wessex were both made Royal Knights of the Garter by Her Majesty the Queen. Prince Andrew and Prince Edward are both appointed to this the most senior British order of chivalry amid a weekend of celebrations to mark Her Majesties 80th birthday. This high honour recognises their seniority with the Royal Family and joins their father HRH Prince Philip, their brother HRH The Prince of Wales and sister The Princess Royal in the Order and more recently HRH Prince William of Wales. Windsor Castle, is the largest inhabited stronghold in the world and is furnished with works of art from the Royal Collection. This historic fortress is situated alongside the River Thames in Berkshire in Southern England and stands proudly on its wooded chalk ridges which has been the home to Her Majesty Queen Elizabeth II and earlier sovereigns of England since the days of the Norman Conquest over 900 years ago. It first existed as a Norman stronghold built of earth and timber by the forces of William the Conqueror to control the country after his invasion in 1066. King William who reigned from 1066 to 1087, was the first Norman King of England after he defeated Harold Godwinson (King Harold II ) at the famous Battle of Hastings in 1066, where Harold was killed after being hit in the eye by an arrow. William was subsequently crowned King of England on Christmas Day. Windsor Castle formed one of a ring of garrisons built to command the area around London, this particular site being of strategic importance not only because it dominated the Thames, then the main freight route into the interior but also because the castle was only one day’s march from the Tower of London. King Henry II rebuilt the castle in stone and began the curtain wall and the subsequent construction of the Round Tower. Henry III is credited with then adding the five circular towers to this curtain wall and Edward III then undertook extensive construction which included building an inner gatehouse with cylindrical towers, the College of St George, new Royal apartments for the King and Queen, the Great Hall and the Royal Chapel. Over the centuries successive monarchs continued to add to these alterations and improvements including George III and George IV who were responsible for further extensive improvements to the castle and are now buried along with William IV, in the Albert Memorial Chapel. 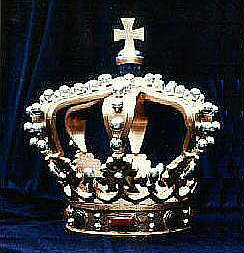 The only disruption to royal ownership for 900 years was in 1642 when the English Civil war broke out and King Charles I who was not popular in Windsor fled to York after there was rioting in the town.. Consequently having made no attempt to defend his stronghold at Windsor the castle fell into the hands of Oliver Cromwell's Parliamentary forces in the charge of Colonel Venn. Thousands of troops were billeted in the town and Fairfax and Cromwell were frequent visitors. These forces then proceeded to steal treasures and plate from St George's Chapel. The dean and cannons not only had to then endure the indignity of being evicted from their houses, but also of knowing the nave of the chapel was to be used as a stable for the horses of the parliamentary forces. Parliament later commanded "to take care that there be no disorders and disturbance made in the Chapel at Windsor" However despite this decree many monuments and windows were smashed and furnishings looted. The castle itself was then used as a prison for Royalist prisoners, including the now captured Charles I who was held at the castle before his trial for High Treason and subsequent execution outside London's Banqueting Hall at Whitehall. King Charles I body was bought back to the castle on the 8 February 1649 and was buried inside St George's Chapel in silence, as the Parliamentary authorities would not allow the use of the funeral services as prescribed by the Book of Common Prayer. The location of the king's tomb which remaining unknown for over 150 years was subsequently found underneath the floor of the Quire, this vault also contained the remains of Henry VIII and Jane Seymour. Following the English Civil War, the Castle's primary role became that of a royal palace. During the Second World War, Windsor Castle was home to the young Princess Elizabeth later to become HM Queen Elizabeth II.. Today The Queen regularly uses the Castle spending most of her weekends there. The Castle has remained largely unchanged since the early nineteenth century, apart from the restoration work following the fire which took place on 20 November 1992. The fire broke out in the north-east part of the Castle in the Private Chapel, when a spotlight came into contact with a curtain and ignited the material. The fire spread at roof level to surrounding areas of the castle despite frantic efforts of castle staff and the fire brigade to control the flames. Fortunately most treasures and works of art had been removed temporarily and so few items were lost, although over 100 rooms in the Castle were badly damaged or destroyed. The fire consumed the ceilings of George IV's and Grand Reception Room and gutted the Private Chapel, the State Dining Room, the Crimson Drawing room, Brunswick Tower and St George's Hall which for many centuries was the place were State banquets were held for Royalty and Heads of State. Just prior to the fire such dignitaries being entertained by HM The Queen in St George's Hall included the former Polish president Leck Walesa and former United States president Ronald Reagan. It took 250 fire-fighters one-and-a-half million gallons of water and some 15 hours to extinguish the fire. Nine principal rooms and over 100 other rooms over an area of 9,000 square metres were damaged or destroyed by the fire, approximately one-fifth of the Castle area. 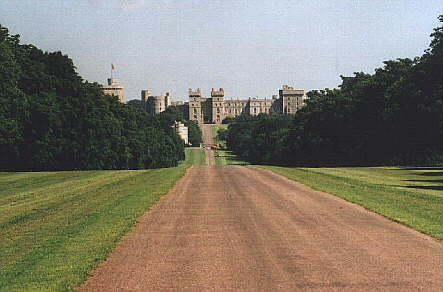 It then took five years to restore Windsor Castle at a cost of £ 37 million to its former glory. The Queen's Free Chapel, or more commonly known as St George's Chapel is dedicated to the Blessed Virgin Mary. St George and St Edward the Confessor of St George was founded in 1475 by King Edward IV as the chapel for the Order of the Garter and was eventually completed by King Henry VIII 50 years later. 'Free' in this sense means that the Chapel is a "Royal Peculiar" therefore it falls under the direct authority of the Queen, rather than any of the normal Church of England structures. St George's Chapel is also the final resting place of Ten Royal Sovereigns including Charles I, Henry VIII and King George VI. St George's Chapel shares the distinction along with Westminster Abbey of being not only one of the most revered hallowed Royal shrines of the British Monarchy, but also one of the most beautiful buildings of its kind in the world, rich in history, and a place of prayer. The Chapel belongs to the College of St George which is a self governing community of priests and laymen. Dominating the lower ward of Windsor Castle for over 500 hundred years St George's Chapel one of the most beautiful ecclesiastical buildings in England, is the home of the College of St George and the Order of the Garter. It is the last in a succession of chapels in the castle , of which the earliest was built in the late 11th century for the needs of the garrison, king and court. In 1240 King Henry III ordered a chapel to be built in the lower ward, close to his new apartments. It was dedicated to St Edward the Confessor and stood on the present Albert Memorial Chapel. Unlike most other great churches, the show front of St Georges Chapel is on the south side facing the visitor entering Windsor Castle by means of the main King Henry VIII Gate. The outside of the magnificent building is compact and almost symmetrical with octagonal chapels protruding from three of its four corners. 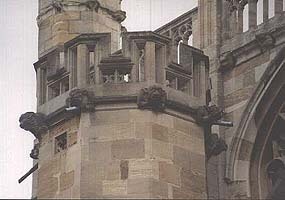 The chapel roof which is supported externally by flying buttresses,. 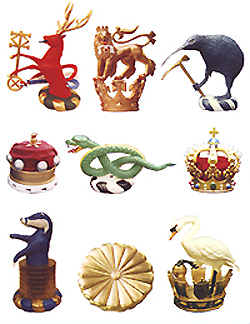 is decorated with fourteen different types of 'Windsor Beasts' repeating along the roof making seventy-six beasts in total, of which six of these are unique to the Windsor series. There has always been a strong connection between the Royal Family and St George's Chapel. Over the centuries members of the Royal Family have been baptised, married and buried there. HM The Queen is closely involved with the life of the College and attends matins at the chapel on Easter Day, there are also many other times when The Queen and the Royal Family attend the Chapel, especially every June when they can all be seen attending the annual ceremony of the Most Noble Order of the Garter. The Chapel was also the venue where the service of blessing took place after the royal wedding took place between HRH Prince Edward and Sophie Rhys-Jones, the Earl and Countess of Wessex, the funeral of Her Majesty Queen Elizabeth the Queen Mother and more recently on the 9 April 2005 the Royal wedding of HRH The Prince of Wales and HRH Camilla Duchess of Cornwall. 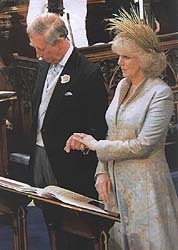 More than 800 guests were at the Chapel which including all the members of the British Royal Family, European royalty, politicians and show business stars, to witness Prince Charles and Camilla pledge their love for one another at the most elaborate Service of Prayer and Dedication, presided over by the Archbishop of Canterbury and watched by over 500 million TV viewers worldwide. Views inside St George's Chapel, Windsor. 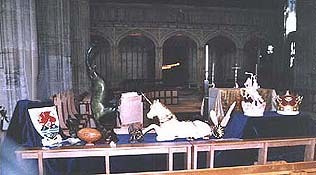 Many of these Royal Crowns, Coronets and Crests carved by Ian G Brennan on the South and North Stalls within the Choir and Chancel of St George's Chapel; photographs taken in 2004. Ian G Brennan was invited to Windsor Castle to give a talk about the various aspects of his work as a sculptor. 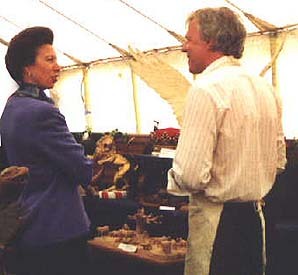 This talk to the invited audience held in St George's Chapel was not only about the wide variety of sculptures he has produced for the past twenty three years for the Royal Household, but also how he starter his career as a sculptor. 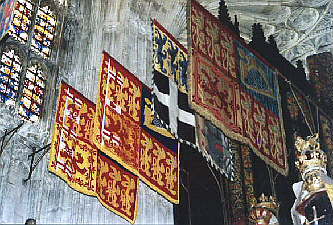 Each Knight of the Garter is allotted a stall (seat) in St George's Chapel Windsor Castle and above it is placed the medieval symbols of chivalry, his banner which was often carried in battle bearing his coat of arms, these arms were also often worn as a tabard over his armour which helped to identify him. On top of the stall is the knights helm (or helmet) on this is placed his crest or in the case of foreign sovereigns the crest is replaced with a crown, which again is used as a form of recognition. In 1475- 1485 under the medieval woodcarver William Blakely's direction the magnificent woodwork in the Choir was produced with later alterations being made between 1787 and 1790 when the stalls were enlarged. At the end of each block of 'desks' are ornamental tops or 'poppy heads' with each of the faces ornately carved with various stories. On the north side the stories are about the Passion and Resurrection of the Lord and on the south side are stories depicting St George and the life of the Virgin Mary. The above photographs show one end of these carved desks alongside the Prince of Wales Stall, the photos also show a close up of one of these original carved tops of one of the earliest remaining relief carvings depicting St George Slaying the Dragon remaining in Windsor Castle produced by the medieval master carver on the relief carving of St George the patron Saint of England, for whom this historic Chapel has been dedicated. The helm has mantling hanging either side of it which is symbolic of the cloth that would have help protected the knight in his armour from the rain or sun. There is also the half drawn sword which represents the fact that in theory every Knight of the Garter has his hand on his sword ready to defend the Sovereign at any time. When a Knight Companion dies his Banner, Crest, Helm and Sword are taken down and the insignia returned to the Sovereign. The stall is roped-off and a laurel wreath bearing his name is placed in it. The Knights stall is not used again until his Banner is offered to the Altar. This ceremony which is reminiscent of medieval practices takes place some time after the Knights funeral which is attended by members of his family, Knights Companion and Officers of the Order. 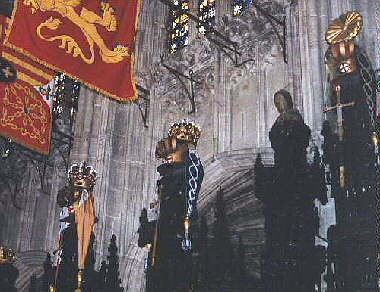 The Banner is brought in procession by the Military Knights during Evensong and is then received by the Dean and placed upon the Altar. Prayers are said for the Deceased Knight Companion and the Order. The Garter Knights brightly coloured brass enamel stall-plate showing the knights full coat of arms, title and the date of appointment to the Order which is affixed to the back of the stall soon after the instillation service and remains there in perpetuity. At present there are almost 800 Garter Knights stall plates in St George's Chapel the earliest surviving plate is that of Ralph, Lord Basset of Drayton who was elected to the Order in 1368. He was one of the leaders of the English army which, led by the Black Prince defeated the French at the Battle of Poitiers in 1356. 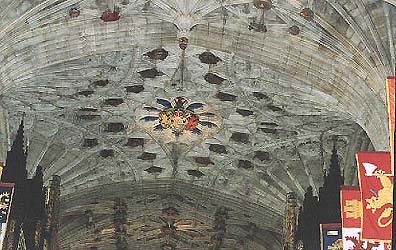 The stall-plates in St Georges Chapel provide one of the best examples of the fine history of heraldic designs during the past six centuries. 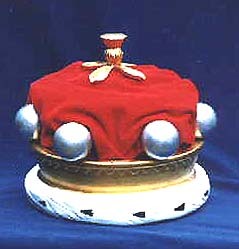 Such is the prestige of the Most Noble Order of the Garter, when Sir Winston Churchill died in 1965 his Garter Crest depicting a 'Lion holding a staff' was taken down from above his stall in St George's Chapel Windsor Castle, the crest was then mounted on a stave and carried with great ceremony throughout Sir Winston's State Funeral procession. His coffin placed upon a gun carriage and draped with the Union Flag, Sir Winston’s insignia as a Knight of the Garter, his collar, garter and star gleamed in lone splendour upon a black velvet cushion placed upon the coffin of the gun carriage which was pulled by a Gun's crew of naval ratings, for the State Funeral service which was held at St Paul's Cathedral in London. Sir Winston Churchill's Garter Crest and Stall plate along with the carved and gilded Coronet carved by Ian G Brennan for Lady Soames; Sir Winston Churchill's daughter. Although a number of Garter knights have been 'degraded' over the years for the crimes of heresy or cowardice, one of the main reasons that a Knight is removed from the Order during his lifetime is for Treason against the Sovereign. In ancient times this would often mean being beheaded, with Henry VIII alone accounting for six. Between 1387 and 1716 twenty Knights were removed, six of whom were subsequently reinstated. Most degradation occurred because a Knight fought on the wrong side and then lost! Two of the most famous of these disgraced Knights during this period was " Warwick the Kingmaker" Richard Nevill, Earl of Warwick who was appointed in 1460 but was later killed at the battle of Barnet in 1471 and later in the 16th century Edward Stafford, 3rd Duke of Suffolk incurred the displeasure of Henry VIII and was executed on Tower Hill at the Tower of London. During World War II, the crests and swords of the "extra knights" Emperor Hirohito of Japan and King Victor Emmanuel III of Italy were removed from the order's St George's Chapel. The conferment of this high honour has also been refused however, in 1945 when Winston Churchill's Conservative party was voted out of office Mr Churchill refused the Order of the Garter when it was first offered to him. In private he explained, "I can hardly accept the Order of the Garter from the King after the people have given me the Order of the Boot." However, Mr Churchill relented and in 1953 he was inducted into the order. During the middle ages ladies were associated with the Order although they did not enjoy full membership. One of the last medieval ladies to be honoured was the mother of Henry VII and grandmother of Henry VIII, Lady Margaret Beaufort. After her death in 1509 the Order remained exclusively male, except for reigning queens as Sovereign of the Order. This situation remained until 1901 when Queen Alexandra was made a Lady of the Order by Edward VII. In 1987 Her Majesty the Queen decided that ladies should be eligible for admission as Companions of the Order, with the same rank and privileges as Knights Companions. The first Lady Companion to be appointed was Lavinia Duchess of Norfolk in 1990, followed in 1995 by the former British Prime Minister Baroness Thatcher. .
Lady companions are now included in the establishment and have the same rights, duties and privileges as Knights Companions. Their style and titles is shown as 'LG' after their names, as opposed to the 'KG' used by Knights Companions. Ladies do not display helmets, mantles and swords but only their carved Crowns and Coronets are placed in position above their stalls, The exception is HM the Queen who as Sovereign of the Order, displays the helmet, mantle, crest and sword. Her Majesty Queen Beatrice of the Netherlands joins HM Queen Elizabeth the Queen Mother, her own mother Princess Juliana and Queen Margarethe of Denmark as the contemporary Ladies of the Order and HM The Queen's daughter HRH Princess Ann, The Princess Royal who was the first Princess since the Middle Ages to be awarded such a high honour. In 2003 the Queen's first cousin, Her Royal Highness Princess Alexandra was also installed Lady Companion of the Most Noble Order of the Garter. Lady Soames who is the daughter of Sir Winston Churchill was installed as a Lady of the Garter on the 13 June 2005 and is the first non-royal, father daughter appointment in the orders 650-year history. 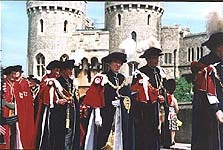 Every June, the Knights of the Garter gather at Windsor Castle, where the new Knights take the oath and are invested with the insignia of the Order, which consists of the Garter, Star, Riband, Collar and Mantle. The Knights and Ladies of the Garter and their spouses receive a royal salute by the Guards on duty as they enter Windsor Castle via the King George IV Gate entrance. HM The Queen as Sovereign of the Order of The Garter, attends the Garter service along with other members of the Royal family who are in the Order, including HRH the Duke of Edinburgh, HRH the Prince of Wales, HRH the Princess Royal, HRH The Duke of Kent and HRH the Duke of Gloucester. During the Queens Jubilee Year in June 2002 the crowned heads of Europe gathered at Windsor Castle for the grand spectacle of the Garter Ceremony and a dinner in the Waterloo Chambers to celebrate the Golden Jubilee. King Juan Carlos of Spain, Queen Beatrix of the Netherlands, Queen Margrethe of Denmark and Grand Duke Jean of Luxembourg all Knights or Ladies of the Garter all took part in the annual procession down the hill to St George's Chapel. They were joined by the Royal Family which included the Queen, the Duke of Edinburgh, the Prince of Wales, and the Princess Royal and at the Galilee Porch of the chapel waiting for the procession to arrive were Grand Duchess Josephine-Charlotte of Luxembourg, Prince Henrik of Denmark, Queen Sophia of Spain, Queen Sonja of Norway and the Earl and Countess of Wessex. Invited guests awaiting the procession of the Knights of the Garter outside St George's Chapel. To view the full movie, please click here. On Garter Day, Windsor Castle is closed to all visitors other than those invited to attend the Garter Service or to watch the Procession of the Garter Knights to St George's Chapel. 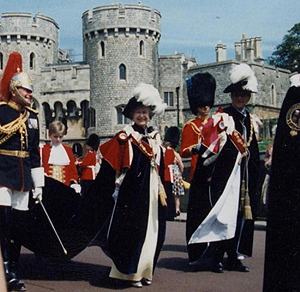 Members of the public (including overseas visitors) may apply to the Lord Chamberlain at Windsor Castle, to be included in a ballot for tickets for admission to the courtyard of the Castle to watch the Garter Procession. The Chelsea pensioners dressed in their fine red uniforms prepare to stand to attention when the procession begins outside the Military Knights quarters. 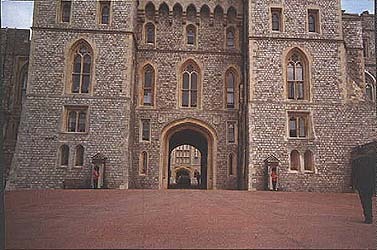 Two military bands then also take up their positions; one band will position near to the Henry VIII Gateway near to the Guardroom. The other will be positioned alongside Henry VII Tower. These bands play both during and after the procession. On Garter Day when a new Knight is invested, he still receives exhortation to the Christian Faith, the procession in which he walks is not only a means of proceeding from the Royal Apartments at the Upper Ward to the Royal Chapel, but it is also a public witness to the long tradition of the Sovereign and leaders to the nation giving their allegiance to God. 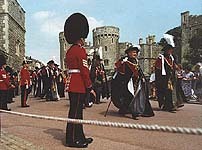 The procession itself is led by the Governor of the Windsor Castle Sir Richard Johns wearing his blue full dress uniform of an Air Chief Marshal, with the red ribbon of the Order of the Bath. 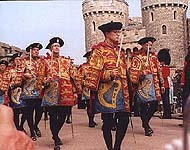 The officers of Arms who are the purseuivants and heralds then follow wearing their black knee-breaches and colourful tabards bearing the Royal Arms, their role on the day being to marshal the procession. Heralds were originally appointed to organise and make the announce at tournaments, to act as diplomats and to record the various insignia borne by the individuals and to carry as a non combatant messenger, messages from place to place, as well as to make declarations of war. In the early Middle Ages the Chief herald was called the Marshal. In those days when it was the custom for the King himself to go to war, it was therefore the marshals’duty to 'marshal' the army in groups with their banners and 'coats of arms'. The most newly created Knights of the Garter walk down at the front with the more senior Knights at the end, these Knights wear the dark blue velvet robes adorned with the cross of St George, surrounded by the Garter motto: "Honi Soit Qui Mal Y Pense" on the left breast . These robes of blue velvet mantle and red velvet hood worn on the right shoulder, black velvet hat and white Ostrich plumes. These robes are also open on the right side to give freedom to the sword-bearing right arm. The Knights are then followed by the members of the Royal Family which include the Princess Royal and the Prince of Wales with the officers of the Order following behind wearing their scarlet and blue robes these includes the Secretary of the Garter, who is responsible for the organisation of all the various aspects of the ceremony, the Register who is the Dean of Windsor, Garter King of Arms, the Chancellor, Lord Carrington who is a Knight of the Garter himself and the Prelate, the Bishop of Winchester, who reads the lesson and gives the blessing during the service in St George's Chapel. This group of people are then followed in the procession by the Sovereign, who walks with the Duke of Edinburgh. The Queen's train is carried by two pages who in turn are flanked by the Field officer in Brigade Waiting who is a Guards officer, and either a Life Guard or a Blues and Royal officer. The procession down to St George's Chapel finishes with a detachment of the Yeoman of the Guard, walking in fours wearing their fine Tudor uniforms. 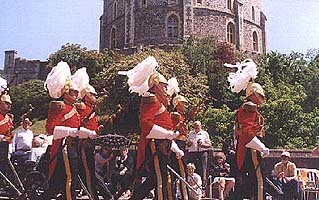 The Yeoman of the Guard were created by Henry VII in 1485, following his victory in Bosworth. Their unique Tudor uniform of a scarlet doublet is embodied with a Tudor crown and the roses of York and Lancaster.The uniform including red breeches and stockings is complemented with black buckled shoes adorned with rosettes.They are not the same as the Yeomen Wardens of the Tower of London and the nickname 'Beef Eaters' belong only to the men of the Tower. The Garter procession arrives at the Great West Door to enter St George's Chapel, the Choristers (boys) and Lay Clerks (men) who form the Chapel Choir, along with the Minor Cannons and the Cannons of Windsor are already lined up in the Nave ready to lead the Procession through the Nave into the Quire. 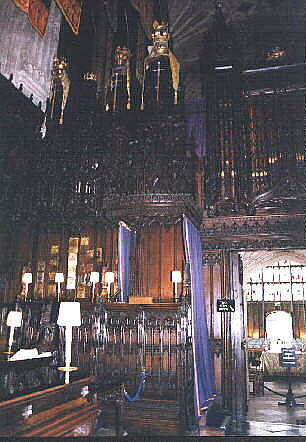 At the instillation ceremony in 2002, after the Procession entered the Quire, everyone went to his or her appointed seat, The Queen however remained by her stall and the newly appointed Knight remained in the Quire. After the National Anthem was played. Lord Carrington, the Chancellor of the Order called out the name of the new knight in response to the Queen's bidding : "It is our pleasure that the companion newly invested be installed." King Harald was then conducted to his stall. The service of Thanksgiving then followed, during this the choir proceeded to sing a Te Deum - which is a traditional hymn of praise to God, which was followed by prayers for the Order and the Sovereign. This service of Instillation was relayed from St George's Chapel by loudspeakers to those waiting outside. 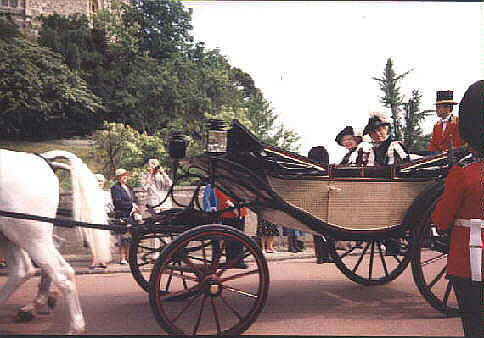 During the Service, horse drawn Landaus and various cars were driven down the procession route to convey The Queen, Foreign Sovereigns, members of the Royal family and the Knights and Ladies of the Garter, their spouses and the Officers of Arms are also driven back up the hill at the end of the service. 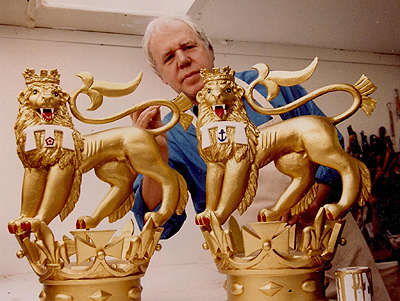 Ian G Brennan was officially appointed the Sculptor to the Most Noble Order of the Garter and the most honourable Order of the Bath in1989 and has been commissioned to carve, paint and gild these Crowns, Coronets and Crests for all the Royal Knights, Extra Knights, Knights and Lady Companions of the Most Noble Order of the Garter along with several Knights swords. Ian also creates the Crests for the most senior Knights Grand Cross of the Most Honourable Order of the Bath which are then placed in Henry V11 Chapel in Westminster Abbey. 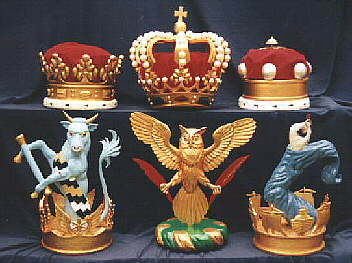 Each of these Royal Crown, Coronet or Knights Crest are all individually made for each Knight of the Garter and Bath and are therefore totally unique. 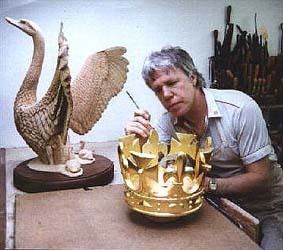 Each one can take Ian between two and six weeks to produce and are mostly carved from lime wood which he then paints and gilds and the sizes range from between 12 - 28 inches high. 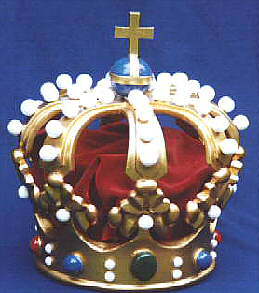 The Royal Crowns and Coronets are carved with gilded rims set with carved and gilded jewels, or when appropriate for Sovereigns the jewels are coloured. 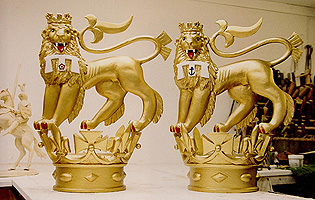 The golden arches Ian makes for many of the different Sovereigns Crowns are fitted with rows of large white or silver carved wooden ‘pearls’ which are placed above either open Crowns or above a carved crimson caps. 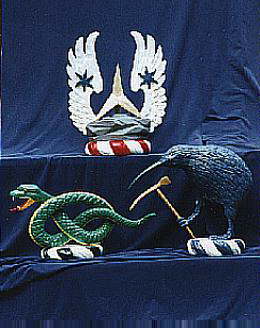 A small selection of these carved and painted Coronets and Crests produced by Ian G Brennan; all are between 12 - 28 inches high. for the Royal Knights, Knights and Ladies of the Most Noble Order of the Garter which were placed in St Georges’s Chapel in Windsor Castle. The completed Crest for the Emperor of Japan in position alongside the Crown for HM King Harald of Norway. HRH The Prince of Wales crest alongside the crest for HRH Prince Andrew, HRH the Princess Alexandra coronet and the crest for HRH The Duke of Kent. These photographs taken at St George's Chapel Windsor Castle by Ian G Brennan are used with the kind permission of The Deans and Cannons of Windsor, permission for further use of these images must be sought from the Chapter Office, The Cloisters, Windsor Castle. SL4 INJ. and Sons Ltd, by Peter J Begent and Hubert Chesshyre.